One of the most popular posts on my blog is the one about rust removal on Chrome. Naked metal left by itself to the elements will react with ambient air and oxidize, the by-product of which is ugly rust. Chrome plating bare metal parts protects them but sometimes the elements and time are strong enough to go through that barrier and still cause rusting. There's also a question about the quality of the plating. Not all plating jobs are equal. There's a big difference between a plating job on a cheap Chinese bike and a triple plating show Chrome job on a Custom Harley. Back to our main topic. Chrome parts on a bicycle look awesome but the opposite can be said about the parts being slowly eaten away by the evil result from the natural chemical reaction of oxidation. In the previous post I showed you how to get rid of it by using steel wool, some Chrome polish and a polishing cloth. Many of you left comments on how good this worked and then we had a bizarre suggestion about using regular Aluminum kitchen foil with water! I can confirm, as many of you already have, that it works remarkably well to remove rust from Chrome bicycle parts. I myself use Chrome polish and even WD40 instead of water with the foil and the results speak for themselves. It removes the rust a lot faster than steel wool. 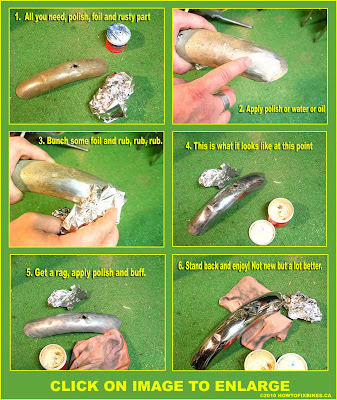 Simply cover the part in water, WD40 or metal polish and rub with a bunched up piece of foil and voilà! Chrome looks amazingly good. ( See the image above of one of my CCM Marauder fenders.) This will not reverse serious pitting or flaked off plating, some parts are sometimes just too far gone. So try it yourself and be amazed like thousands of our readers. Until next time, ride safe and Godspeed. p.s. Don't forget my free ebook on basic bike maintenance for newbies. Download from here. One of the reasons that chromed parts can still corrode is that the layer of chrome is full of microscopic cracks. They're far too small to see, but large enough to admit air and water etc. This is why chrome-plated steel parts are sometimes first coated with (softer but less permeable) copper before the chrome plating is done. I don't know if this is ever done in the bike/automotive industries, but it's common to do with e.g. commercial-grade bathroom fittings. Ffion I'm glad I could help and thank you Anonymous for clarifying this up. What can you apply to the frame to prevent rust once you have removed existing rust with either the foil or the polish and steel wool? You can shoot the bike with a few coats of clear. This will protect any bare metal exposed. I'll give it a shot. The foil trick worked fairly well in removing most of the rust. Thanks for the advice! So simple yet so effective! I am very happy I came across your page. You made my 1977 Peugeot UO8 road bike restoration project that much easier. Using your technique on the chrome parts makes the bike look 3 years old and not 34 years old. Thank you Gerry! My pleasure Lukasz, always a pleasure to read about such a rescue. Good job. When you reference applying "clear" to protect the chrome after polishing, what is the specific recommended brand and type? Hi, I don't know if anyone's going to answer this but I'll try asking anyways. Um, this is going to make sound like a complete amateur, but I was wondering if there was anyway to get rust off the gears and stuff? Would this method work? I'm not sure what metal the gears and breaks (etc.) are made of which is why I'm asking. Also, is there a way to get rust off the chains, or do I just have to replace them? It should work as well, maybe try with a steel wool pad or wire brush instead of the foil if the rust is too tenacious. As for the chain, if it is too rusty your best bet is to replace it. Thank you for this! The used bike I found for my daughter is all shined up and ready to ride, and I didn't even have to go to the store for supplies. If chain isn't to far gone you can soak it in motor oil over night, the scrub with wire brush. It's messy but it does work. Also work on other metal like nuts and bolts. Do not use motor oil. It is a magnet for dust and other crap. Use automatic transmission fluid instead. The chrome on the handelbars of the bike I'm trying to fix up is almost completely flaked off. What should I do to make the handelbars at least look alright? 13daye: tape them from end to end. Have just found your page. GF is about to start her first restoration project, 1923 Raleigh all steel bike. The push rod brake rods appear mostly chromed and ae in a bad way. Going to clean them up and then take a view on getting them re-done. Cheers for the tip, will no doubt be back. 1923! That's almost a century old. Glad my blog is helping saving another vintage bike. Use Coca Cola and liberally pour over rusted chrome...then use aluminum foil to scrape it off followed by chrome polish..
Did you know that you can create short links with AdFly and make cash for every click on your short links.